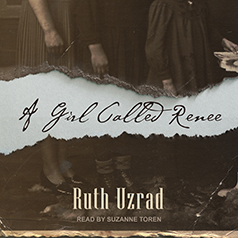 A Girl Called Renée is the unbelievable autobiographical story of Ruth Uzrad, a Jewish teenager whose life was turned upside down by the Nazi regime. Terrified after her father's arrest by the Nazis, Ruth flees to Belgium. This is the unbelievable autobiographical story of Ruth Uzrad, a Jewish teenager whose life was turned upside down by the Nazi regime. After her father was arrested one night from their Berlin apartment by the Gestapo, Ruth's mother sends thirteen-year-old Ruth and her two younger sisters out on their escape route across Europe by train to the safety of Belgium. But then the Nazis also reach Belgium, driving Ruth into the French Jewish underground . . .
Later, when the Nazis conquer Belgium, Ruth and one of her sisters escape to France, leaving the youngest sister behind to be taken in by a Belgian foster family. Later, Ruth joins the Jewish underground movement in France and takes on a false identity and a new name, Renee. As an underground fighter, she participates in special operations aimed at rescuing Jews in danger. When the German police set out to arrest her, she manages to cross the border into Spain and eventually makes her way to Israel, where she makes her home and spends the rest of her life.